PrimePort is an all weather port with an easy approach channel and a sheltered inner harbour. Vessels of up to 261m in length and 11m draft have regularly called at the Port. PrimePort provides a 24/seven pilotage service, all year round. To assist in the berthing and un-berthing of the vessels, PrimePort is served by two tugs, supplemented by the pilot launch. 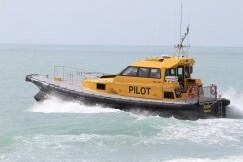 Pilotage is compulsory for vessels over 500 gross registered tonnes or over 40m in length. Pilots join the vessels at the pilot boarding ground, south of the Fairway Beacon. Marine operations are conducted on VHF channel 09. The port provides access of up to date weather information, accessible to all users. The Weather System can be viewed on the Met Data portal. PrimePort operates a berth booking service for liner vessels serving the Port on a regular basis. Berths are made available to other vessels as per the PrimePort Berth Policy. Contact for advance bookings can be made via email. Hunter Hydrographic Services (HHS) provides comprehensive, high quality and competitive hydrographic survey and dredge support services to a number of ports in New Zealand and Australia.